Tour Of Stitch Supply Co. This weekend I taped a tour (via Periscope) of the space well under way. Construction is coming along fantastically. Go great, that I wanted to share the progress with you. Fabric baskets are such a fun project for any skill level. They are a great use of scraps with unlimited possibilities. Let me give you few tips and tricks to get this project underway. 1. Scraps of fabric. 1" to 1.25" by the width of the fabric works best. The large basket in April Rhodes' Bound fabric collection took about 50-60 pieces and this basket measures 13" in diameter and 8" tall. 2. Cording. Bonnie Craft Cord that is 6mm in diameter is what I used. This is a cord is 100% polyolefin. It worked great because I was covering it up completely. If you plan to leave exposed areas of cord, I would suggest a cotton cording. Although I have not tried it myself, I have heard that cotton clothesline works great. Look for this in the sports and camping section of the store. 3. Thread. This basket is made using a zig zag stitch therefore, you can use up quite a bit of thread. I will let you be the thread police here, but think about using a less expensive thread. For the stitch setting, I used a zig zag stitch set at 5 wide and 2 in length. Starting your basket is probably the most difficult part. That being said, don't get discouraged early on. Just keep trying!! Simply wrap the fabric around one end of the cording, coil your end up slightly and start stitching. It takes a bit of finessing but you'll get it! Continue stitching with the zig zag stitch grabbing your current section of cording and the new row of cording. To add a new section of fabric, simply overlap your other end and continue twisting. Keep the bowl flat until you have the size you would like for the bottom of the bowl. Next we start to create the curve of the bowl. This is done by pulling just a bit on the new cord you are adding. Keeping that new cord just a bit tighter than the last row of cording on the bowl will create the curve. How tight you pull on the new rows, will determine how sharp of a curve your bowl will have. 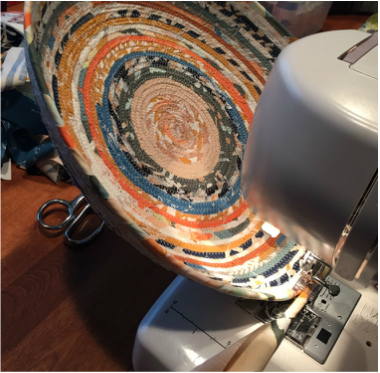 With my large bowl, I was able to watch the gradual curve grow as I was sewing. Continue on until your bowl is large enough or you someone walks in and sees you trying to hold the bowl up with our head and hand while guiding the stitching with you other hand -- because that would be embarrassing! I added handles to my basket by marking off a 5 inch section on each side of the basket, and I marked a 6 inch section of cording. You can see by the photo that I abandoned by zig zag stitch on the basket part and continued it on the handle cord. I then rejoined the handle and the basket at the marked lines. To finish the basket, cut the cording about 2 inches shorter than your fabric. Twist the fabric and zig zag down. Go around the basket with a zig zag stitch one more time. That is all! Simple as can be. There are so many variations to this basket. I look forward to seeing what you all come up with! Please enjoy and let me know if you have any questions. Announcing...Stitch Supply Co & Retreat!! There are several methods for transferring embroidery designs onto your fabric. Lets go over a few, including heat transfer, light source and transfer paper. The supplies are: heat transfer pattern, fabric, interfacing or stabalizer, pins, scissors, iron and ironing board. The Alphabet Sampler pattern will be used for our example today. For fabric, I am using a tight woven quilters cotton. For the Interfacing, use a ultra light weight fusible interfacing. Pellon makes several varieties that work great of this. 44FPKG8 is my Pellon interfacing choice for today's project. Interfacing is an optional step in this process, but I will feel that it keeps my stitches looking cleaner as there is less movement in the fibers of the fabric. To start off, prepare your fabric by ironing it really well. Getting all the bumps and folds out will really help in transferring your pattern nicely. The next step is to adhere the interfacing to your fabric. One side of fusible interfacing has a texture on it. Simply rub it between you fingers and you can feel the small adhesive/glue dots on one side. Place the interfacing on your ironing board with the adhesive side up. (Double check this or you will adhere the interfacing to your ironing board!) Lay your pressed fabric centered on top of this and iron. It is really important to take your time with this step. Pressing the fabric really well as to make sure the fusible interfacing will stay attached to your fabric as you move and bend it while stitching. Okay, lets start transferring! You will notice there are instructions for which side is for tracing and which is for transferring per the directions at the top of the pattern page. Also, at the bottom there is the Stitch Supply Co logo and copywrite. Go head and snip this off using your paper scissors. This will transfer (although backwards) onto your fabric, so it is a great way to test the transfer method on a scrap piece of fabric. At this time, make sure the steam on your iron is TURNED OFF. Steam will blur the lines and your pattern will not transfer nicely. So TURN THE STEAM OFF! Place our scrap fabric on your ironing board. Next place the pattern with the transfer side down. If you look close the transfer side is gray while the ink side is black. Pin the ends. Pinning the pattern and fabric right to your ironing board works well. Simply iron (set to the temperature appropriate for your fabric) for several seconds. Lift one end to see your results. It usually just takes a just a couple seconds of heat, but this all depends on your fabric and iron settings. If your happy with your sample, lets get ready to transfer the Alphabet Sampler! Lay your peviously prepared fabric right side up (interfacing down) on your ironing board. Center the Alphabet Sampler pattern tracing side up on your fabric. It is very important to control the movement of the pieces as you iron. A great way to do this is to pin your fabric and pattern directly to your ironing board. Next TURN THE STEAM OFF on your iron. Carefully iron your pattern. Try using slow movement as not to shift your paper. To make sure you applied heat evenly, take a pin or two out and peek at each letter. After you feel confident that everything is transferred, step back and admire your work! If you have a digital copy or would like reuse your paper copy, tracing the image onto your fabric might be a good choice. It is great if you have a light box, otherwise a sunny window works perfectly. Before the tracing, you must pick your writing instrument. There are temporary and permanent choices. For temporary, there are several brands of pens on the market that are washable. They usually have blue ink. These are great because if you make an error in tracing, you can simply wash out the ink after stitching. My personal favorite choice is a Sukura Pigma Micron Pen. This is a permanent pen, so attention to detail is very important. I have also heard of people using a mechanical pencil, however, I have not tried this method myself. Prepare your fabric as directed above. If you are using a permanent marker, you can iron the interfacing on after you are done tracing. If you are using a washable pen, you must iron on your interfacing BEFORE you trace. If you iron on your washable ink tracing, the iron will heat set the ink and it will not longer be washable. Set up your transfer station in a comfortable and well lit spot. Washi tape is a great for taping your pattern to the window (tracing side up) and then taping your fabric over that. It is important that your fabric does not move as you trace, so tape generously! Make sure you can see the pattern though the fabric as well. Simply trace away and take breaks often! To create your pattern with transfer paper, prepare your fabric according to the directions in the Heat Transfer section. With your interfacing fused to your pattern, use washi tape to tape them to a hard surface. Next you layer your transfer paper and then embroidery pattern with the tracing side facing up. Again, it is important that your pattern does not shift during tracing, so grab that washi tap! I prefer to use a ball point pen to copy the letters. The firm pressure of the pen will create a transfer of the image onto the fabric. There are many brands of transfer paper on the market. Saral is a great brand that I prefer to use. It comes in a variety of colors. The white works perfectly if you want your pattern on a darker color fabric. The transfer also washes out of fabric. There you go! I think this covers everything but please let me know if you have any questions or if you have any tips or suggestions, we would love to hear those as well. The Stitch Along is right around the corner! Thank you all for joining in. Really, it is great to have you on I am looking forward to showing you the ropes to get you started with (or addicted to) embroidery. Do you have all your supplies? If not, do not worry, there is still time to join in! Here is our schedule and 1st of February will start week one. We will be hopping and skipping around the alphabet in order to learn the stitches and build our skills. The Stitch Along start date of February 1st is quickly approaching. Do you have your project idea planned? Are you going stitching the whole alphabet or just some simple phrases? Our next step is to pick colors. If you are going with the preselected colors on the pattern - AWESOME! They are a great combo. If you want to change things up a bit, lets chat. If you are like me, sometimes BAM the perfect colors pop out at you. Other times, you go around and around trying to make the perfect combination only to end up walking away. I bring in help by recruiting our daughter to make some selections. We spread out the bins (perk of the job!) and start mixing and matching. She is a pastel mood. Great combos, but not quite what I was looking for. Our son swings by to see what we are doing. We share our struggles. He sits down and selects a great combo and off he goes. It took him all of 5 minutes. Sometimes, that is just how it goes! Now, if you don't have kiddos around to help you, no worries, I have some tips. I am going to let you in on a little secret - Fabric designers know color! They do! I know, right?! To Take advantage of their skills select a favorite fabric. Don't focus on the design of the pattern (unless you want to use the fabric in your finished project) but just the colors. Anna Maria Horner is a color genius. The colors in the Honor Roll collection are amazing. Take a peek at the salvage and the fabric together. Pull the closest floss color for each salvage dot. Sometimes there are a lot of colors in fabrics, but that is okay! Your selections can be narrowed down later if need be. Sometimes fabrics don't have salvage colors. An example is fabrics from the Cotton & Steel collections. Take this fabric (Jacks Natural Multi) from the Playful Collection by Melody Miller. There are no salvages, but just matching up floss with the colors in the fabric works perfectly. Too much color for you? How about a neutral Alphabet Sampler. With maybe one or two important letters highlighted in a brighter color? @Citybee (Instagram) has created this color combo for her Alphabet Sampler. Simply Love it. The first two color combos will be listed in the shop as well as the Finca Floss color card so you can mix and match at home. I do have all of the floss in stock, but not all listed on the site. If you need help with making a color combo for your project, just drop me an email and I am happy to help...or my son will! Ready to stitch the whole alphabet? Awesome. Or are you new to embroidery and think that might be big task for you? No worries. Here are a couple ideas of simple projects that work perfectly with the Alphabet Sampler. You will still have the opportunity to learn the embroidery process, just with a smaller project. How about a pillow with a name? Or just an initial? Here is one I created for my daughter. Or maybe a zippy pouch with a initial on it? 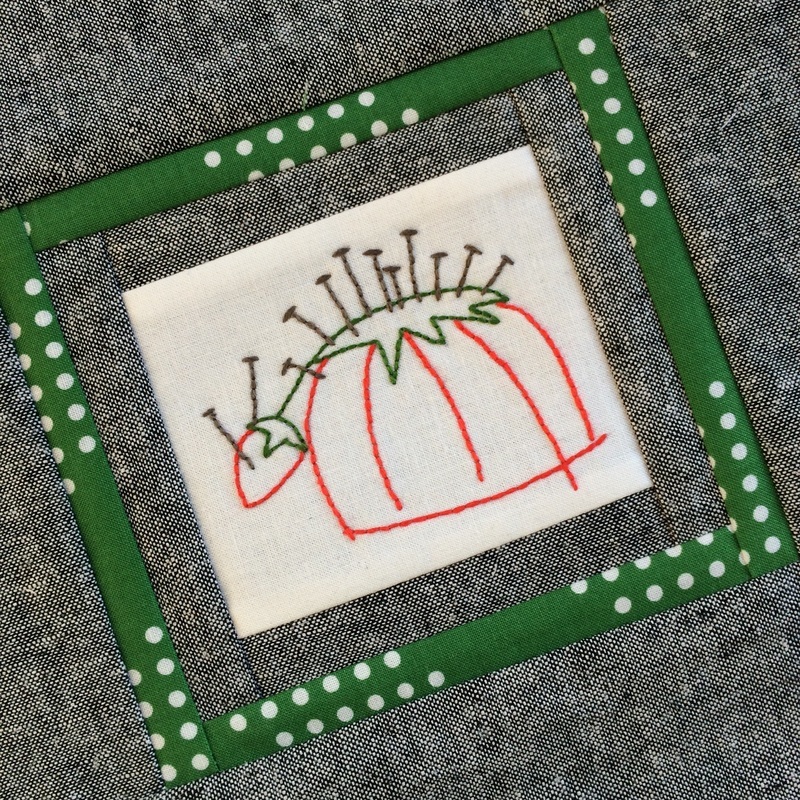 I used the I Sew Therefore I am embroidery pattern to create this fun sewing zippy. Or a little pin cushion love? We are so happy to release the new Alphabet Sampler. As a fun kick off to this event we will be hosting a Stitch Along. If you are new to embroidery, perfect. You are in the right place. If you are experienced, perfect you are also in the right place. We will walk you though, step by step, the process of starting and finishing this project -- and all the stitches in between. The Stitch Along will officially start on the 1st of February. Until then, we will chat it up about the pattern, project ideas, selecting colors and tools needed. Thanks for joining along! For more photos and updates please follow StitchSupplyCo on Instagram. My very favorite part of cutting out a quilt is cutting out the pattern. Well, I also love the very last stitch. Grab your templates and lets get started! Do yourself a favor today and put in a shiny new blade for the cutting of this. Trust me. There is a lot to cut and a sharp blade will make this job more enjoyable. For the petals, simply place your template (that you adhered to card stock) on top of your fabric and cut. I will admit, I trim 2-3 at a time. Using the 45mm rotary cutter works great as these are gentle curves. Save your scraps for the centers! Cut 168 (or more) petals on print fabric and 168 snowballs out of the light or low volume fabric. Let's talk centers. Measure a few of your recently cut petals against the center square. As you can see from the photo my petals are a tiny bit bigger then the template. This is where I set the template aside and mark my ruler with washi tape equal to the width of the petal. Making a square. Washi tape. Why? Here is my biggest tip for you!! First, it keeps my eyes from going crazy trying to measure for each of the 42 squares. Second, it is a stop for my fabric. Stay with me here... Place two layers of washi tape exactly on top of each other. So that is four total. Take a piece of fabric that you will be using to cut a center square from. Trim one corner to 90 degrees. Next, flip your ruler upside down. I know, things are getting crazy around here! Slide your ruler over the fabric until it bumps your tape. Trim off the remaining two sides. Repeat 41 more times!